The accuracy of servo drives depends on all components in the drive train. Every non-linearity or drift in encoders, quantization of current and voltage measurements, delay in control algorithms and even the back-lash in gear boxes have to be included in the simulation model. 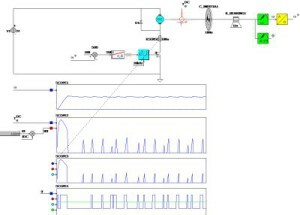 The multiphysics library in CASPOC includes special models from which the entire servo drive can be built. Highly detailed electric machine and single phase actuator models (including all position and saturation as well as efficiency data) are calculated in FEM and imported into CASPOC for a complete drive simulation. By using the generic electrical machine and generic control blocks, a drive train concept is easily set up. From a concept to a ready-for-production prototype, detailed electrical machines can be modeled from FEM, including all delay and non-linearity in each and every component.